FullStory gives you out of the box insights, and the ability to construct searches and find insights without any instrumentation. You can always search for users who clicked any CSS selector or text on your site to get insights right away. 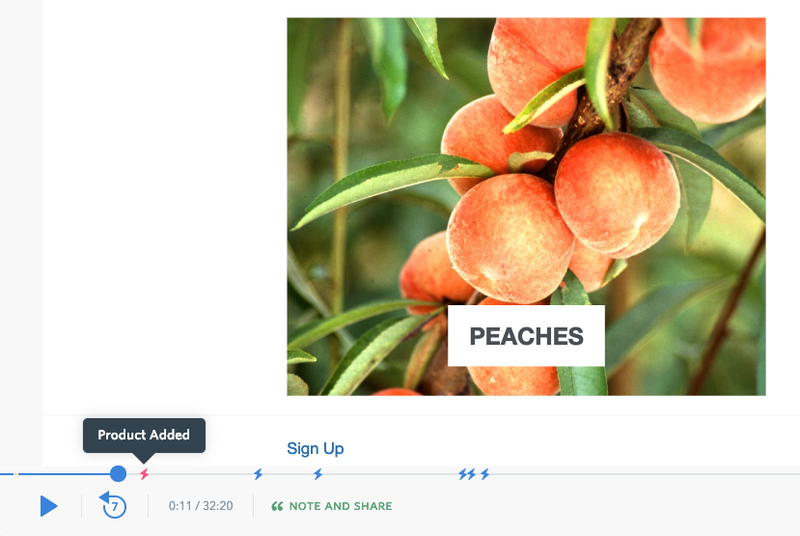 Then when viewing sessions, jump straight to the most important part and view the useful properties you've sent over. 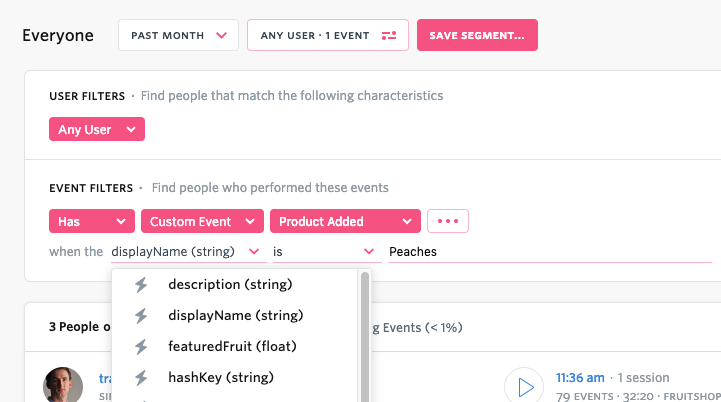 If you have already instrumented custom events in Segment or Tealium - we have integrations to pull in your events automatically with no extra code to write. Visit the Segment integration or Tealium integration page for more details. Currently you can only send client-side events, not server-side events into FullStory. The eventName parameter is a string containing the name of the event. The exact event name will be searchable via FullStory’s OmniSearch capabilities. The eventProperties parameter is a JSON object containing additional information about the event. The set of properties relevant to each event may vary widely. Event properties will be searchable via OmniSearch. eventName and eventProperties have specific formatting and content requirements. These requirements are detailed in the (Recording Client API docs). If event names or properties do not meet these requirements, they will not be recorded into FullStory. Add the FS.event code to your website, redeploy, and then follow the Testing Information below to see your custom events inside FullStory! 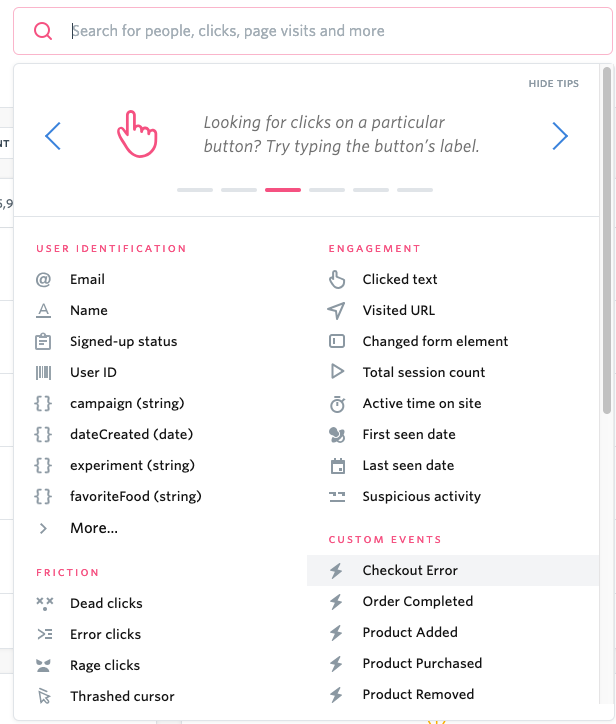 To successfully use FS.event, please check that the FullStory snippet deployed on your webpage is up to date with the snippet in your settings page. You're specifically looking for a line in the snippet with the phrase "g.event". If the snippet you have installed on your website doesn't have the g.event line, please update your snippet. Please review the Recording Client API format docs for a comprehensive look at all the limitations and guidelines for sending custom data over to FullStory. Custom event names must be strings no longer than 250 characters. There are no reserved characters for custom event names, so any characters or symbols can be used. Custom events with names longer than 250 characters will be rejected. Empty string custom event names ("") will also be rejected. FullStory cannot currently ingest event properties that are arrays of objects (with the exception of the “Products” property in “Order Completed” events, more details below); these values will be ignored until future work to support them is completed. All properties should be type suffixed in accordance with the requirements in (Recording Client API format docs). If a property is not type suffixed, we will attempt to infer the type. Type inferencing is meant as a fallback, and we recommend that all custom properties sent to FullStory include a type suffix. 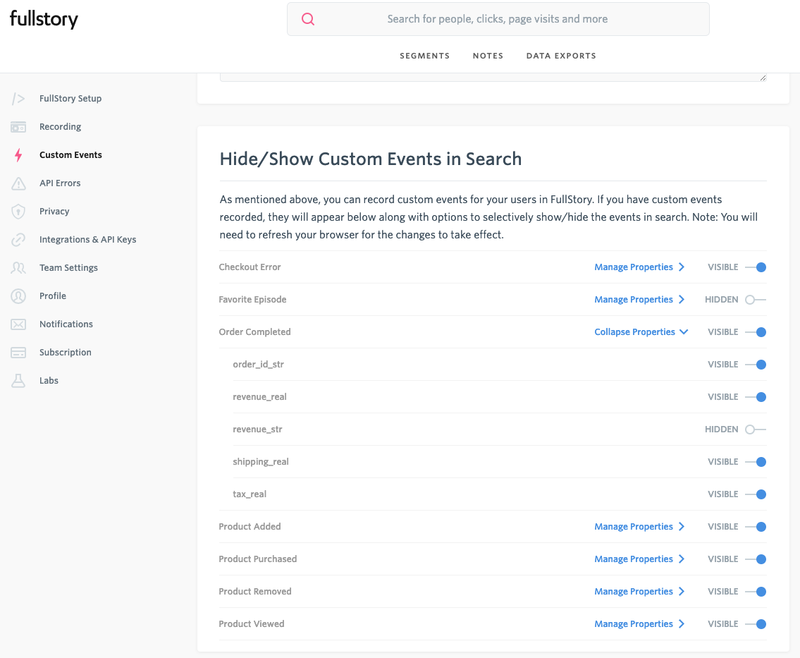 FullStory will index and make available to search any custom event names or properties that you need for your use cases. However, if you are still designing your event naming and payload schema, we recommend adopting the Segment event schema. We plan to surface functionality and analysis for events that conform to this specification. An example of this analysis, and one that we support currently, is tracking the dollar value of Order Completed events for the purposes of revenue attribution. More details below. If you have a data format that differs from Segment’s schema, FullStory will happily accept, index, and make searchable that data too. You should just know that some future search functionality may be more limited. ✅These 2 examples of events will be accepted by FullStory. 🚫Below is an example of an event passing in an array of objects that will be ignored. “Order Completed” events get treated in a special way by FullStory. The “Order Completed” events undergo an additional transformation to facilitate future searches based on revenue. Arrays of objects are generally ignored, but we make an exception to accept arrays of objects in the products property in an “Order Completed” event. If you’d like to format your “Order Completed” events to take advantage of future revenue searches, we’d recommend following Segment’s “Order Completed” spec. There are three things that we do when we receive an “Order Completed” event. We split the products in the "Products" property into their own event called Product Purchased. 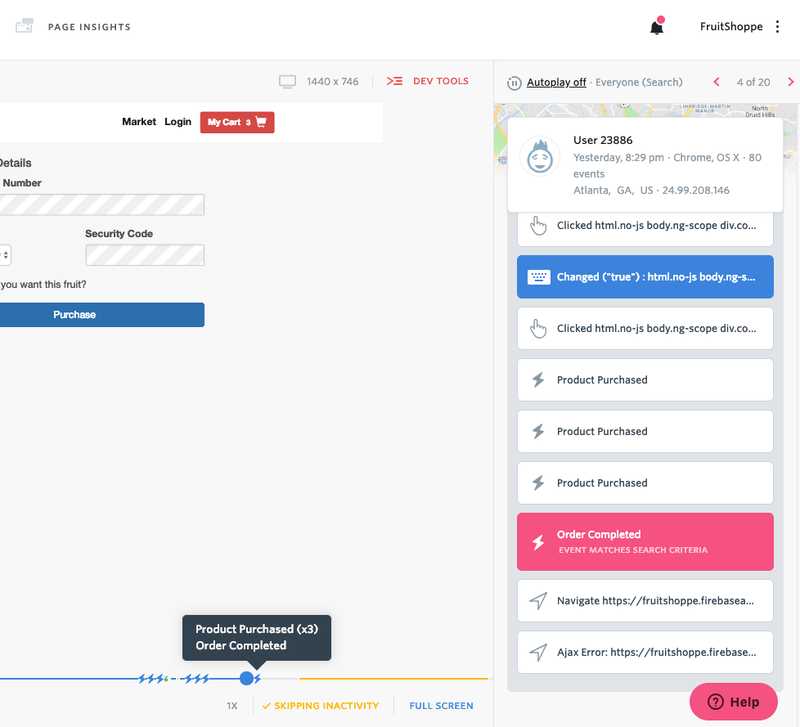 To help track the products to their order and connect them back to the order that they were purchased on, we copy down the orderId and checkoutId properties from the Order Completed event to the Product Purchased event if they’re available. To facilitate future work toward revenue attribution, we will also calculate the revenue from price and quantity property, if they’re both available. This is set as another property called revenue in the Products Purchased event and is searchable in the FullStory app. So what does this mean when you’re looking at a FullStory session? If an “Order Completed” event that includes 3 products fires, you will see 1 “Order Completed” event and 3 “Product Purchased” events at the same point in the timeline. Here is an example of an `Order Completed` event call. The above Order Completed event gets translated into the following three events in the FullStory app. 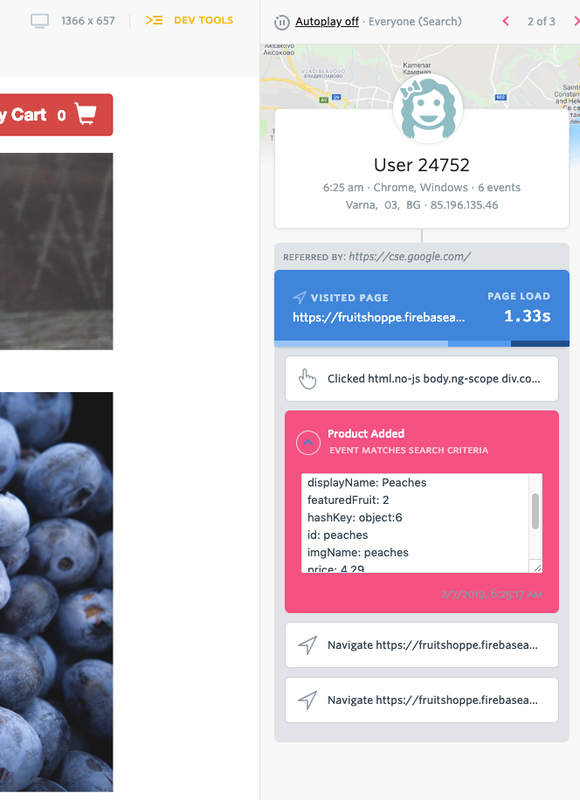 After you've added the FS.event code to your website, perform a test event (like added a product to cart, or signing up for the email newsletter). Wait up to 30 minutes, or refresh the page. Then test within FullStory to see if you can see the events you sent over with names and properties. 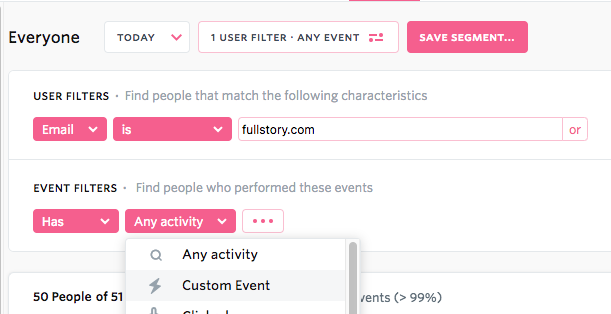 To confirm that your events have successfully sent to FullStory, look for the custom events in search as well as event filters. Finally, check out the settings page to make any minor adjustments. You can hide certain properties or events if needed (if you made a mistake, or no longer need to see that event in FullStory). Over time, as your session retention window passes, older events that you stop using will no longer appear in this list. 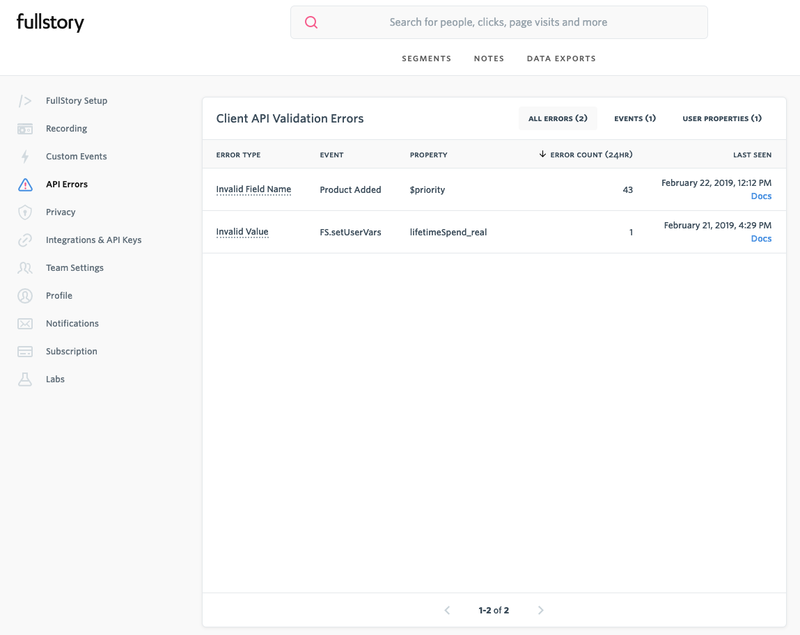 You can also look at the API errors table to troubleshoot if you're having any issues with your custom events coming through. Check out our Troubleshooting resources to answer any questions that come up based on the errors you see.